I like Bryan Cranston, a lot in fact, as he’s one of my favourite actors. I also like James Franco, perhaps not quite as much as Cranston, but when he’s good he can be pretty awesome. So, a movie where these two actors finally come face to face on-screen should be a goldmine, right? Unfortunately, that movie is Why Him?, which although is not a godawful movie, definitely doesn’t live up to its potential, either. It’s basically the typical oddball-boyfriend-meets-girlfriend’s-stern-father movie that you’ve seen countless times, in films like Meet The Parents and so forth. In this case, it’s hardworking father Ned (Cranston) who is introduced to his daughter Stephanie’s (Zoey Deutch) boyfriend, who happens to be the extraordinarily wealthy, but filterless, app designer Laird (Franco). Of course, the conservative Ned immediately hates Laird’s guts based solely on his vulgar personality – which consists of him dropping constant swear words and sexual innuendoes in front of him and his family – and becomes ever more determined to keep his daughter, wife (Megan Mullally) and son (Griffin Gluck) away from his influence, especially when he learns that he plans on proposing to Stephanie. You should know exactly what kind of movie this is going to be before seeing it, if you have already sussed the direction it’s going to go in from the first ten minutes. A number of father-versus-boyfriend hijinks are going to ensue, including some forcefully telegraphed gross-out humour, drug misuse, and lots and LOTS of swearing; it feels like a filthier version of a formula that by this point tastes a little stale, which unfortunately doesn’t make it any better than it should be. You know every plot beat that’s coming, and what’s sad is that there isn’t even a fresh enough spin on it to keep things interesting, or even funny. Aside from one or two laughs in the entire film, this is a mostly laugh-free affair, with scenes of awkward interactions and scenarios coming off more as just awkward than actually funny, including an unnecessarily extended sequence of Cranston figuring out how to use a Japanese toilet/bidet, which means at least a good five minutes of seeing Bryan Cranston sitting on a toilet with his pants down, a sight most of us were not exactly wishing to see in any circumstance. You can’t blame Cranston for picking a film like this that’s more or less beneath him, because lest we forget his earlier stabs at comedy during the earlier part of his career. People tend to forget that pre-Heisenberg, his most popular role was of the bumbling father Hal in the cult sitcom Malcolm in the Middle, and if anything Why Him? is an opportunity for the actor to return to his slapstick routes, after an endless series of far more dramatic roles. In that regard, he still gives it his all, and clearly relishes the opportunity to do something a little sillier than his normal projects, which for us as an audience gleefully brings us back to the days when he was doing hilarious things on that classic show. Franco, too, has played this kind of role before, the foul-mouthed behemoth with socially awkward tendencies, and Laird in this movie is more or less a watered down version of Franco’s character in Spring Breakers, albeit with just the vulgar language left intact. Again, he seems perfectly comfortable in this role and gives his all to an archetype we’ve seen over and over again, even though he doesn’t seem to want to add much new to it at all. Both actors and their endless on-screen charisma honestly propel this movie further forwards than it has any right to be, but the lack of strong jokes and a tired formulaic plot prevent it from entirely working. The other thing I appreciated was the film’s ability to not make the character of Laird a fully detestable character; he may have no filter and just speaks his mind to the annoyance of those around him, but you can definitely tell that he has a strong heart, and truly loves this woman enough to make their romance seem believable. He could have very easily been a complete douche from the first scene onwards, but thankfully the filmmakers gave him something resembling a conscience despite his many other flaws. 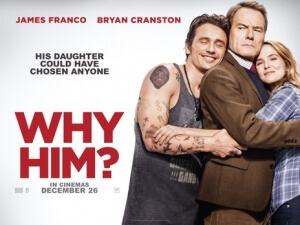 However, even the combined presence of Bryan Cranston and James Franco can’t save a film that ultimately won’t last long in the collective memory, and you can expect Why Him? to fade away with all the other forgettable films with this exact same plot over the years. Why Him? shows co-stars Bryan Cranston and James Franco at their most relaxed in ages, but even they can’t save a mostly laugh-free film with a stale formulaic plot that we’ve seen done much better in the past.